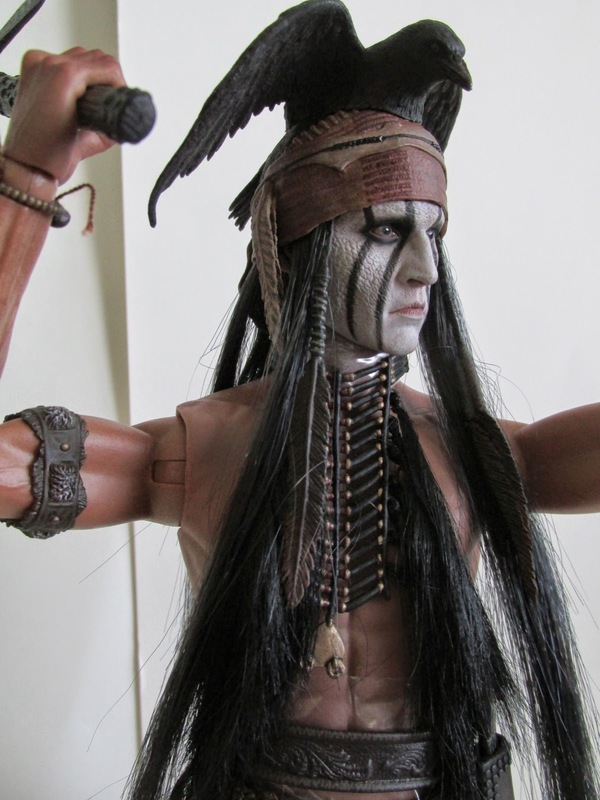 Even though critics and the general public alike critically panned The Lone Ranger, it didn’t stop Hot Toys from cashing in on this failed franchise. 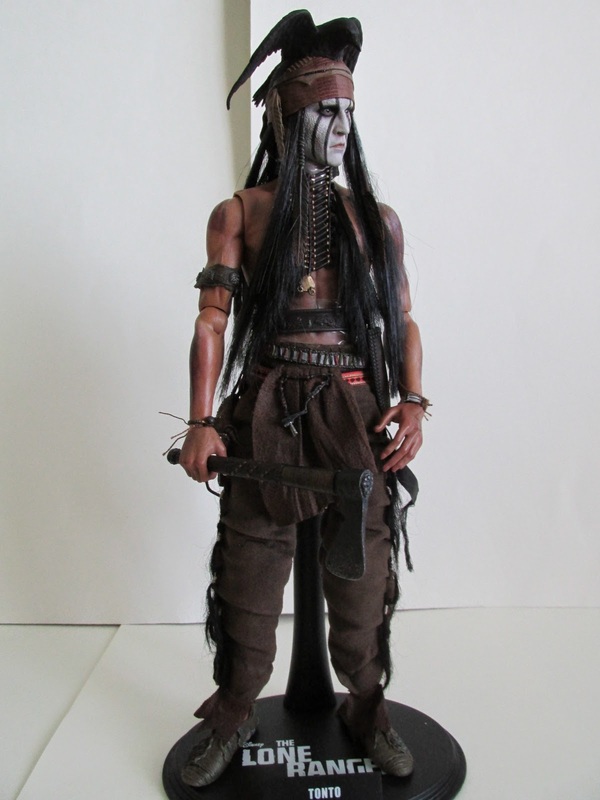 Announced about a year ago, Tonto didn’t really have the fanfare that Hot Toys was hoping for and most likely banking on the success of another Johnny Depp figure. Regardless, this figure is not too shabby. As usual Hot Toys nailed it on the details. 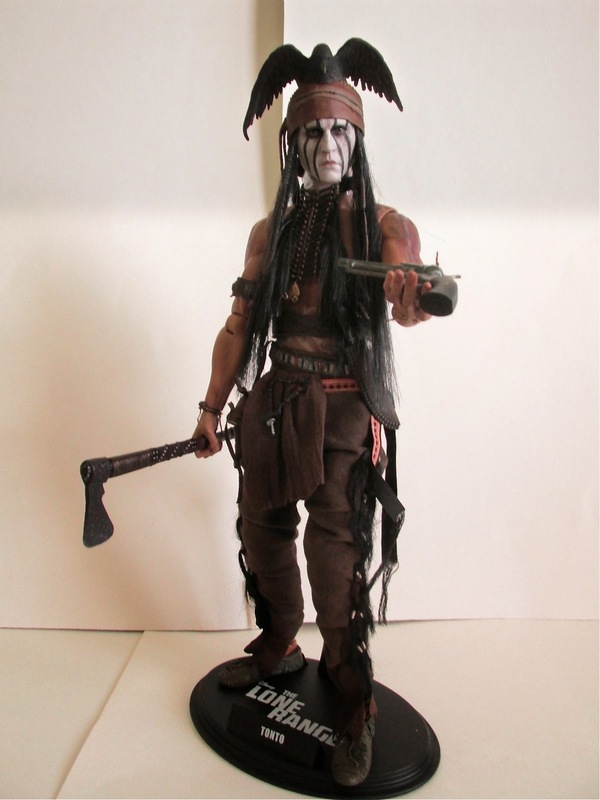 This along with the previous Jack Sparrow DX figure are probably the best sculpts of Depp and the likeness is quite uncanny. The best detail on the sculpt is the cracked white mud makeup on the face. The cracked mud is a nice touch and again shows Hot Toys attention to detail on life like recreations of these movie characters. Accessories wise he comes with the usual sets of hands, one satchel, one revolver, a knife with sheath, two different tomahawks, and two pocket watches; one that is open and the other closed. 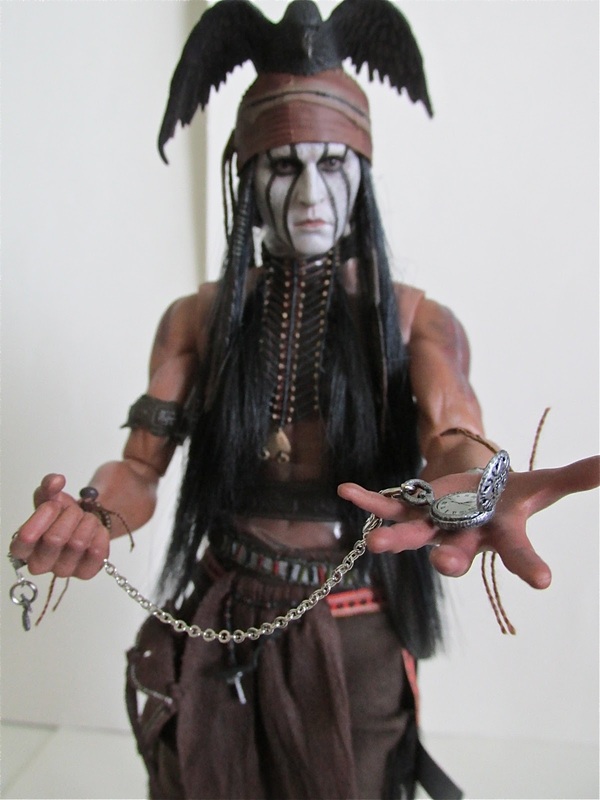 The watches are a nice touch and have a metal chain, which gives a nice weight when posing this prop with the figure. Two things with this figure that are troublesome are the hair and the pouch. The hair isn’t so bad and is actually quite nice. The only problem is after sometime the hair starts to go in all directions, and it can be hard to keep it in line. On the other hand, the pouch is just another troublesome piece to put on. 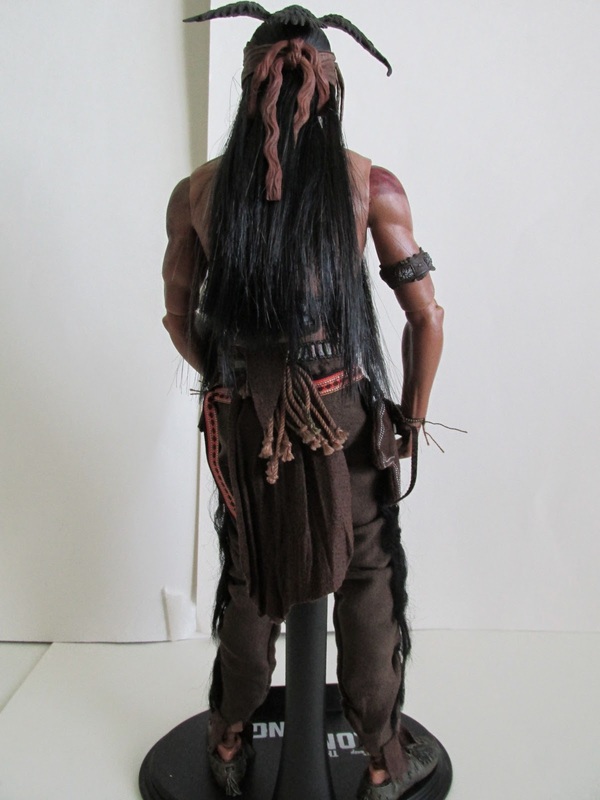 The details on the pouch are nice, but it is just really hard to get that on to the belt of Tonto. I’m not really sure how to put it on without stretching the belt, which you don’t want to do for obvious reasons. I just stuffed one of the knots into the belt and just let it hang. Overall, this is not a bad figure it’s just not as exciting as other Hot Toys releases. This is mostly because it came from a meh movie…wasn’t the worst movie but also wasn’t a great movie. 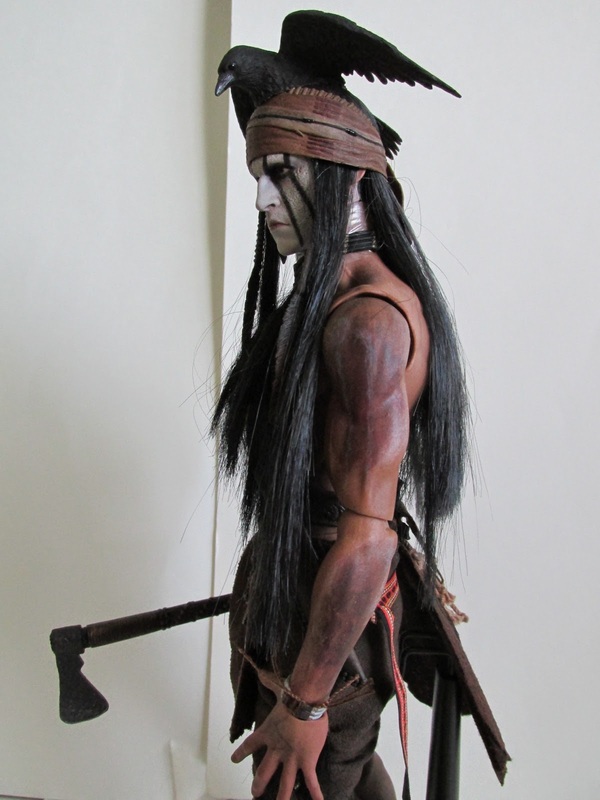 Will we ever see the rumored Lone Ranger figure come out? Time will tell and his release would then make getting this figure worth it.